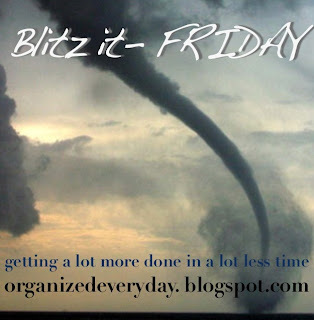 This week I blitzed on three separate occasions, just because it is such a great way to get things done. First I blitzed the kitchen. This is one of my least favorite chores, and sometimes I let it get really bad. Monday was one of those days. The only way to motivate myself to tackle the mess was to set the timer and tell myself I only had to work on it for 10 minutes. I was moving so fast that I finished the entire kitchen (except the floor) before the timer went off. On Wednesday I set my timer for 20 minutes to pick up and vacuum the entire house. No deep cleaning, just putting away all the stuff that clutters our living room, kitchen table, dresser tops, etc. And the floors really needed a good vacuum. I almost finished in time, but I was still moving the couch back when the timer beeped. My last blitz was yesterday, a beautiful sunny morning. It was really a desperate attempt to get my laundry out on the lines early enough to dry completely. With the "help" of my kids, I managed to change the sheets and duvets on all the beds, hang up three loads of laundry, and clean the kitchen floors. I forgot to turn the timer on, but we got so much done in high speed. I love blitzing! I need to use this method everyday. Imagine how much I could accomplish! Christy! So glad you joined us! It makes the world feel smaller, eh? Did you see my frugal Scottish fasion post last Friday? I thought of you. I've been busy making things! Hope you can find pumpkin. I also do some form of a blitz on MOST days. If I'm really tired, I have a kids blitz. If i am energized, I do several for myself! Just finished the kitchen for the day, and it is so awesome! Great job! I reckon the short bursts are the way to go when you have littlies. Jena is right, It is a small world, with one click I can visit the US, Scotland and Africa! I am having a computer break after a 15 min blitz on the bathroom. It's Saturday morning here.